Barnes & Noble announced on Monday that chief executive officer William Lynch has resigned, effective immediately. No reason was given for his sudden departure although one could likely surmise that it may have something to do with the company’s recent decision to stop producing Nook tablets. In the interim, Michael P. Huseby has been appointed CEO of Nook Media and president of Barnes & Noble. Additionally, Allen Lindstrom, vice president and the company’s corporate controller, has been promoted to chief financial officer of Barnes & Noble and will report directly to Huseby while Kanuj Malhotra, vice president of corporate development, has been promoted to chief financial officer of Nook Media. In a statement on the matter, Lynch said he appreciated the opportunity to serve as CEO over the past three years. He further noted that he leaves behind a great executive team and board and looks forward to the many innovations Barnes & Noble will bring its millions of customers in the future. Company chairman Leonard Riggio said they were reviewing their current strategic plan and will provide an update when appropriate. As of writing, stock value is down more than four percent in afterhours trading. 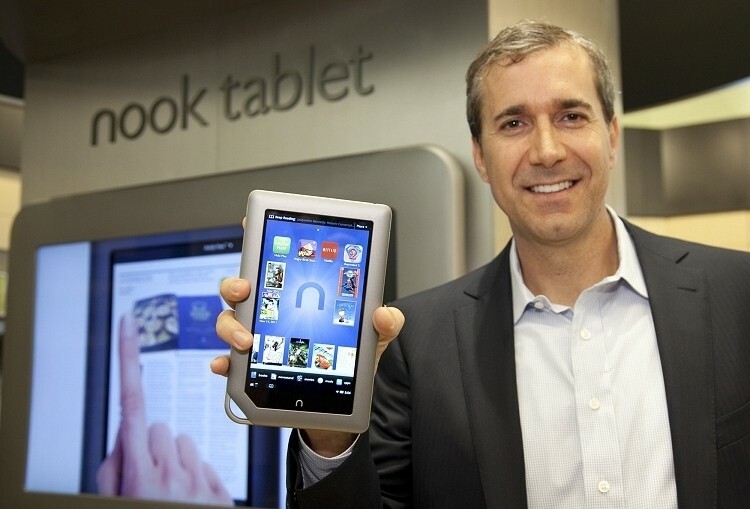 Lynch took over the reins in 2010 and was instrumental in moving towards digital with a heavy push to expand the company’s Nook line of tablets. It’s a gamble that ultimately failed as Barnes & Noble revealed last month that losses in the division helped to wipe out profits generated at their retail bookstores.